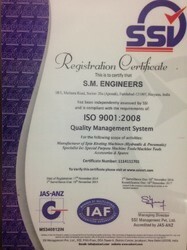 Established in the year 1997, we, S. M. Engineers, are one of the leading manufacturer, trader and suppliers. We hold expertise in manufacturing and supplying a wide assortment of Industrial Riveting Machines. Our offered range includes Spin Riveting Machines, Orbital Riveting Machines, Both End Riveting Machines. These are manufactured according to the defined industry standards, using the premium quality raw materials and advanced technology. In order to meet the specific requirements of our customers, we have set up a well equipped manufacturing unit. The entire unit is installed with all the relevant amenities and advanced & hi-tech equipment for the production of flawless Industrial Riveting Machines. We always endeavour to offer superior quality products. Never compromising on the quality, we supply best quality products in accordance with the international standards. Based on the feedback of our customers, we are constantly innovating our products. We also have a separate designing unit, which is equipped with CAD 2D & 3D software and other designing tools. Under the able guidance of our mentor, 'Mr. Ranjan Gandotra', we have carved a niche in this highly competitive industry. He keeps complete team motivating, to give their best and meet the clients’ demands. His rich industry experience and sharp business acumen have assisted us in developing a widespread clientele across the nation. We are supported by experienced professionals, who possess immense skills and talent in the domain of manufacturing and supplying Industrial Riveting Machines. Banking on their sincerity and dedication, we have been able to achieve an enviable position in the market. They dexterously work to meet the bulk requirements of the customers based throughout the nation. Further, we also conduct various training sessions to keep them in-line with the various technological advancements taking place in the industry. Certificate of registration under single point Registrar Scheme. Units registered under this scheme are considered to be at par with those registered directly with DGS & D.